Discussion in 'Map Factory' started by DrHorrible, Oct 25, 2009. Hello everyone! Thank you very much for taking the time to look at my map. RED and BLU have adjoining/opposing medical research facilities at the top of a MANN CO owned skyscraper in Big City. There's a deadly virus outbreak and RED and BLU both have almost all the data they need to develop a vaccine. As a shortcut to completion and profit, both RED and BLU have decided to engage in a little corporate espionage and are trying to steal each other's formulas to supplement their own research. I'm still learning to use Hammer, so my first goal is to get the geometry of the level established. One of the biggest features of the map is a central Atrium in each base that would allow vertical travel between each of the layers of the map. If anyone has been to an Embassy Suites hotel, you'll know the kind of feel I'm going for. One concern I have is that the central Atrium is too small. It's big enough to allow for some sticky/rocket jumping as well as creative FAN usage, but with that kind of mobility it still feels small. I would like to solicit feedback specifically on the dimensions and sizing of the map, with emphasis on the central Atrium inside the base. Does the map feel too big or too small? Until I've got the macro design of the level finished, working on details is inefficient. I know they're needed, but they can come later. Lighting: It isn't fullbright, but the lighting is comprised of a bunch of light entities I haphazardly threw in just so I could turn off fullbright. They aren't the final lighting solution--they're just an alternative to fullbright. Cubemaps: I'm going to be making frequent revisions at this alpha stage of the map. Building cubemaps while I haven't even bothered with real textures is kind of pointless. Signposting: Nothing is labeled intel or battlements or anything--yet. Skybox: My plan is to use a 3d skybox to create a feeling of being surrounded by skyscrapers. My big concern here is the usage of textures on large flat surfaces. For now I just have a plain 2d skybox to keep out leaks. Optimization: Outside of trying to design geometry to mediate too many sightlines, there hasn't been much done here. I haven't designed the lowest "sewer" level of the map yet. The intention is to keep it spy and pyro friendly, while upper areas are designed more for the mobile classes and snipers. Also, there's a chute that will lead straight from the intel room into the sewer, allowing a very quick exit once the defenses of the intel room have been breached. Locations with the blue grid dev texture are entrances into that lower sewer level. Move to the Big City! Avoid the zombies! See: ctf_quarantine. Hm. This is a very interesting idea, and I like the post layout a lot, but I am worried as to how this will play in tf2. I think that the multilevel idea is interesting, but it heavily favors only certain classes, such as that scout, the sniper, the demo, and the soldier. I think that the building top idea is interesting, but the multi-level layout would be tedious and confusing to navigate, so I might steer clear of that. 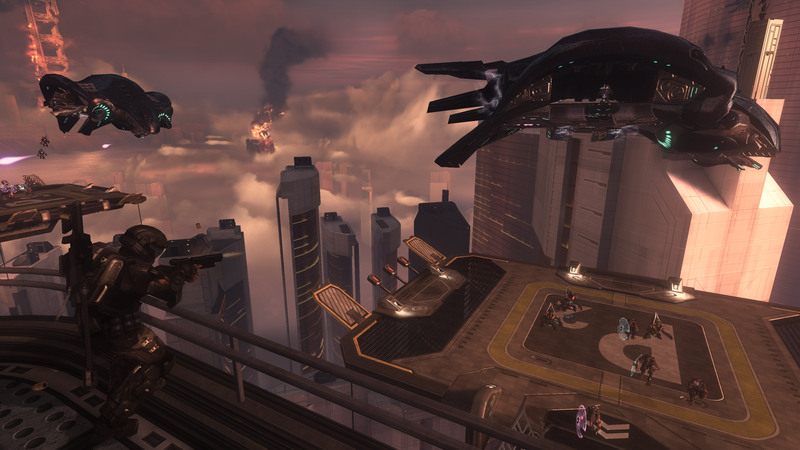 I think that if you made your map a bit to the tune of Halo 3: ODST's Windward firefight map that it would have a much more interesting layout. Also, on that topic the urban theme for tf2 would be a huge endeavor seeing as you would be inventing your own theme. Awhile ago, I considered making a multi-level map hanging off the side of a cliff that would sport spectacular views, and I think this could be the same with your map, but making a city around it would be extremely difficult. So, I like the idea, but I think a layout change could be helpful..
Part of why I wanted to make this map was so that I could have a Left 4 Dead soundscape in certain places of zombies having taken over Big City. @absurdistof: Certain areas will definitely favor the mobile classes, but there will be narrow twisty passageways and wide open expanses and everything in between. By multi-level I just wanted to actually have a 3d level with multiple floors--as opposed to a big 2d map.